Grave in Abney Park Cemetery, Stamford Hill, London N16. 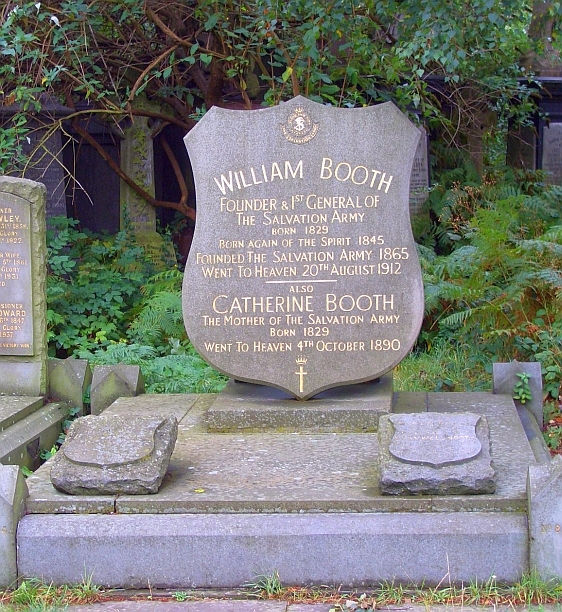 William Booth, founder and first "General" of the Salvation Army (originally the Christian Mission) and Catherine Booth, its "Mother," are buried in the cemetery occupying what was once the estate of Sir Thomas Abney; Abney was a Nonconformist who became the Lord Mayor of London in 1700-1. The cemetery, one of the so-called "Magnificent Seven" which were established to provide final resting-places for Londoners, was opened in 1840 and covers 30 acres. Its entrance, with "lodges and piers in the form of Egyptian pylons" (Rutherford 21) and a little Gothic chapel were designed by William Hosking (1800-1861), later the first Professor of Architecture at King's College, London. The cemetery, which had been neglected, is now being restored as an important green area for people and wildlife alike in this part of London. About 30% of the burials here were Protestant dissenters (Weinreb 138). Amongst these were William and Catherine Booth, whose evangelical mission reached out to the poor, whether or not they were "deserving," and whose work continues all over the world to this day. Catherine Booth's designation as "mother" of the organisation is significant, because she promoted the idea that wives could combine their domestic responsibilities with work in the wider world (see Ball 692). Ball, Gillian. "Salvation Army." Victorian Britain: An Encyclopedia. Ed. Sally Mitchell. New York & London: Garland, 1988. 691-92. Rutherford, Sarah. The Victorian Cemetery. Botley, Oxford: Shire, 2008.